Professional Wrestler and Hound Comics CEO Brimstone Will Be a Speaker at LIPopCon 2015! Brimstone is a professional wrestler, actor, author, philanthropist and comic book/animated hero. He has had a successful and rewarding career participating in and administering numerous entertainment careers spanning well over two decades. As the co-founder and CEO of Hound Comics, Inc., Brimstone and his team of creators launched his comic book series, “Brimstone and The Borderhounds” on October 31, 2010 at Borders Books and as of January 11, 2011 went nation and world wide via Barnes & Noble, Book World, and Amazon. Bridging the gap of wrestling star and the corporate world, Brimstone has an extensive background in marketing, advertising, management, and branding. At Newsday, under Times Mirror and the Long Island Voice, he worked in Senior Management. He created and directed one of the largest employment publications in the Tri-State Area, the Employment Journal, with distribution centers in Long Island, NYC, and NJ; and administered LI Career Fairs, Long Island’s top career fair company. Looking to train up and coming hopefuls in the art of professional wrestling, Brimstone launched Critical Mass Pro-Wrestling Corp, which was considered one of the biggest and best pro-wrestling training facilities in the North-East. Brimstone has also been a Head Trainer for Pro Wrestling Revolution and a guest trainer for FTW Wrestling and many other training facilities across the country. For more information about Brimstone, visit http://www.brimstone.me. 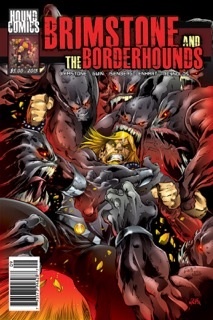 For more information about Hound Comics, visit http://www.houndcomics.com. To learn more about LIPopCon 2015’s other featured guests, check out our Featured Guests Page.